It must have been shortly after I joined Seattle MQG that I discovered Blair Stocker/[blairs]. A fellow guild member, I found her craft - though quite different than my own - intriguing, and I enjoyed following her blog, wisecraft. I remember the day I read about her vintage quilt photo collection and how smitten I was with them. I own a couple of vintage quilts, but have no photos whatsoever of people actually using them. So a collection of old photos of quilts in use seemed very precious to me. Now, personally, I don't think I've ever made a quilt - or much of anything, really - from repurposed goods. I've never been inclined to cut up baby clothes or blue jeans, or make a quilt with hankies.... until now. 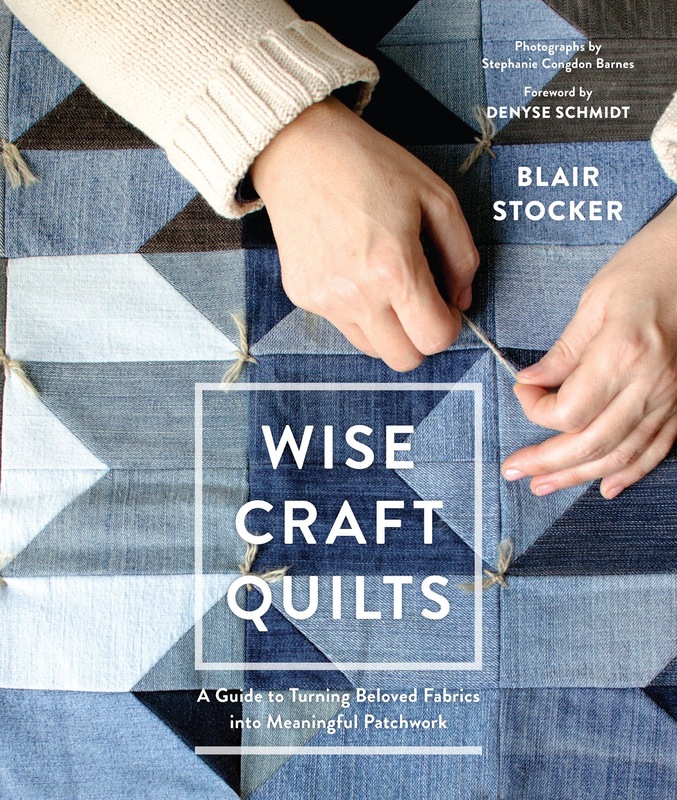 Blair and Roost Books sent me a copy of her new book, Wise Craft Quilts: A Guide to Turning Beloved Fabrics into Meaningful Patchwork, and it has certainly given me something to think about! And truth be told, I do have some ties and shirts stashed away that I've never known what to do with, and several Tanzanian Kanga cloths that were gifted to me, so I already have some unique fabrics to consider. 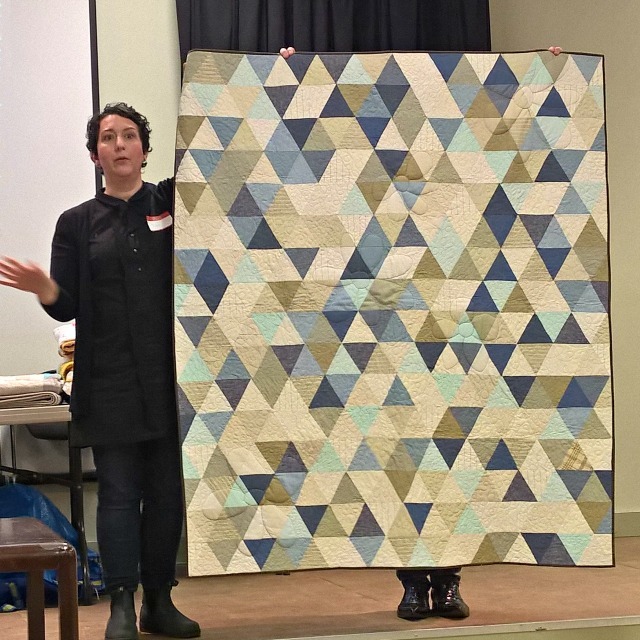 Lucky me, Blair presented a trunk show at our last guild meeting, so I got to hear her stories about some of the quilts and see them up close! The book is really nicely done, and if you've had even a hint that you'd like to create with repurposed or cherished fabrics, or are just plain curious about it, I have no doubt you'd find Wise Craft Quilts useful and enjoyable. Here, you can check out a video trailer to get a feel for Blair and her lovely work. And wouldn't you know, Blair just posted about her interview with Pat Sloan, so you'll want to listen in for sure. There is also a FB group for the book and you can see more on Instagram under the hashtag #wisecraftquiltsbook. *** Giveaway is now over! Congrats to Debbie/Shadows of the Blue Ridge, who was chosen at random to win the copy of Wise Craft Quilts. Thanks everyone! *** Finally, I have an extra copy of Wise Craft Quilts to give away! Just comment on this post, and if there's some 'beloved fabrics' you'd like to make into a quilt, do tell! Besides the stashed items I already told you about, I have a wonderful collection of hankies from my husband's and my grandmothers, and I was really intrigued by the project in the book of making a wholecloth quilt from a vintage tablecloth. Hmm.... See? Lots to think about. Giveaway will be open until Sunday night, April 2. Yes, I was gifted a complimentary copy of Wise Craft Quilts for my own use. But be assured that my opinions and recommendations are always my own, and that I would never suggest a product that I wouldn't actually use and enjoy. When my husband retired, he wanted to cleat his closet of work clothes which are all Reyn Spooner reverse print aloha shirts! I of course saved them and would love to turn them into a quilt but could sure use some ideas. Maybe this book would give me an idea! Oh, oh, oh! I had a friend call me from Hawaii where he and his family were living. They had been to a flea market. He asked "can you make a quilt out of Hawaiian Shirt remnants?" ...I said "Sure so long as they are at least 2 inches wide...send them my way"...so I started dreaming of Hawaiian shirt quilts. My favorite idea was to make a uilt that looked like a post card using bold floral prints to make the letters of 'Hawaii' or 'Oloha' or similar. I was thinking 50's style. I did get the remnants and there were three neutral colors so I had to regroup...I was disappointed but ended up making three quilt tops with the fabric. I still need to quilt one of the tops. Good luck and have fun with that fabric!!! I totally envy you! 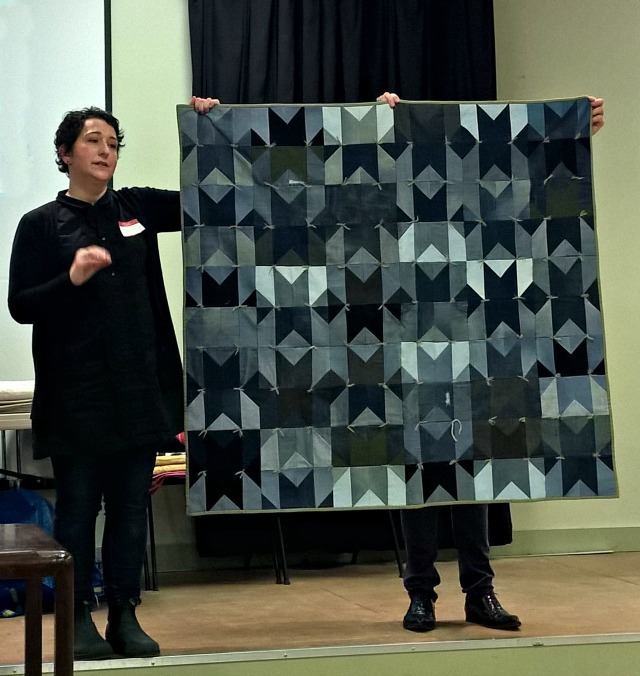 These are all such lovely quilts, this may be the prettiest denim quilt I've seen. I also love the way she used her hankies (I have a collection from my mom and grandma). I've been working on a grandmother's flower garden quilt for years, and every flower contains treasured bits of fabrics from years of sewing, also family clothing and scraps from my mom and sisters. Some date back to late 50s/early 60s. Thank you for the chance to win this beautiful book! I love the variety in Blair's beautiful work! You guys across the pond have been having the best trunk shows. Last week while cleaning out my sock drawer, I came across a stack of some of my grandma's handkerchiefs. Maybe they will soon become something useful? My denim box is overflowing, too, so I think I best get busy. Thanks for the links in your post. I do have cherished fabrics and clothing from my passed family members that I'd like to use to create something so memorable! This book looks so inspiring. Loved seeing Blair's presentation too! I've recently chopped up my wedding dress and plan to use it in some project. Just need to figure out what. thanks for the giveaway. I have lots of my grandmas linens I would love to use in quilts. I "found" Blair about a year ago and she has fascinated me ever since. I love both her make do with what you have attitude and her sentimental spirit. I have my grandmother's clothing that I want to make memory quilts with. Most precious to me believe it or not are her colorful muumuu's that she wore the last few years she lived. I have a small collection of vintage hankies that I'd love to do something with, plus I've got a couple of tubs of my son's baby clothes that is like to make into...a quilt? I think? I need ideas! This book looks wonderful! I have hankies from my Grandmother and Mother that I would love to repurpose so I can look at them everyday. Thank you the chance to win and the peak into what looks like a fabulous book! I love repurposing fabric! My partner has several nice shirts from his late grandfather that are sadly too big for him to wear, but he kept them and asked me to use them in quilts. So far I have used fabric from them in a baby quilt for his niece, and am mixing them into flying geese blocks that will eventually be in a quilt made for us. I also have quite a few pairs of worn out jeans ready for design inspiration to strike! Curious to see how she did the denim ones without tons of bulky seams, as that has been my hesitation thus far. Looks like a very interesting book. I have my two of my mother's suits from the 1940's. One is purple velvet and the other is a soft pink satin. If I can bring myself to cut them up I've always wanted to make them into a memory quilt that was interesting and artistic. Great post, Debbie! I'm so excited to take Blair's class next month. I'm trying to decide on materials to use, but I'm leaning to some vintage table linens I've collected. Thanks for offering up the chance to win a copy of her book. This book sounds great! I would like to make a denim quilt and have been saving for it! some of my children's clothes and other textiles I would love to make into quilts. I would love to have Blair visit our guild. Oh I would love a copy. I have a bag full of my mom's clothing and I've been collecting vintage hankies for a special project!! Sounds like a fabulous book! I have a collection of Aloha Shirts I'm hoping to sew into something and I routinely stash my husband's worn out dress shirts for a future quilt. They looked so good in his closet, why not in a quilt?! Nice! Denim quilt would be great to make. After years of saving some vintage fabrics that my mother had purchased as well as her favorite shirts along with a number of my dad's as well, I have been simply waiting for my own years and years of caregiving and later grief to pass after their deaths to finally be ready to make a memory quilt. I think I just may be finally ready! 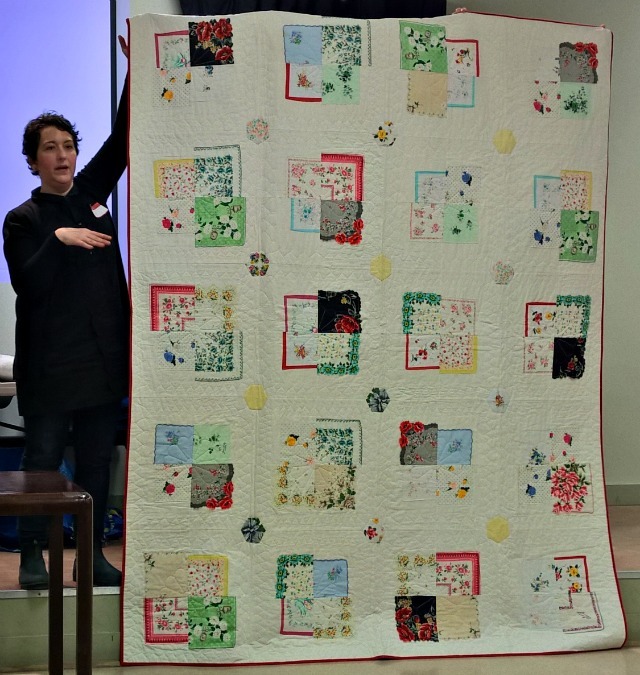 Lovely quilts and a dear post that reminded me how each of us has her own story and it's journey to special quilts. I loved this post and each of these comments so I am quite sure I would also love this book! Thank you for the giveaway!! The book looks amazing!! I do have denim waiting for a re-purpose!! Doesn't everyone have a stack of old blue jeans in the back of a closet? I love repurposing clothing onto quilts because I feel it connects me to previous generations that had to made do with limited resources. We have been sorting out my grandmothers things since she passed away last year. There are some fabrics that she had saved but also her clothes, some of which invoke very strong memories of her wearing them. I would love to do a project with them. 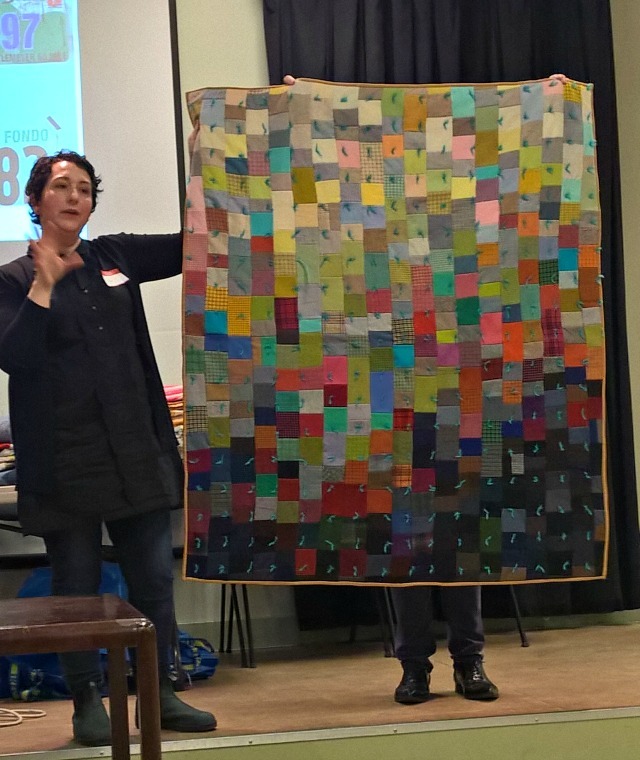 It would be a memory blanket with each patterned fabric having different memories attached to it. Oh, the possibilities! I have vintage Beatrix Potter baby items - bumper pads, sheets, and more. I've saved them and this book would definitely point me in a creative direction! Thanks, Debbie! Love the hankie quilt. I have a small collection of hankies that my daughter gave me from her husband's grandmother. She figured I could make something with them. Thanks for the opportunity to win! I have my Dad's shirts that I would love to make into a quilt. He passed away almost two years ago. Thanks a million for sharing this info! This is an area I have been looking to learn about, the book sounds like it covers all the bases. Thanks for sharing those inspiring photos of Blair's book. Just goes to show that an imagination & a willingness to cut up some special fabric can create amazing memory quilts. What an exciting way to learn color theory and piece vintage linens. Thanks for promoting Blair's book! What a terrific book! I have a denim blouse that y mother had bought for me a couple of days before she passed away. I could never bring myself to wearing it and for a few years now have saved it to do something special with. Maybe I'll finally get some inspiration!! Looks like such an interesting book! I have some denim jean the boys have grown out of which I would love to use in a quilt, and I also have some beautiful doilies my grandmothers crocheted that I would like to use for something special. Looks very interesting, I have some antique 'laying out' sheets (unused!!) that might make a wholecloth quilt. Oh this book sounds and looks brilliant! I've already used quite a few meaningful fabrics in quilts, including a lovely cotton sheet given to me by my gran when I started sewing which has made it's way into a few quilts already. I've got a box of beautiful handkerchiefs from one of my Great Aunts that I'd love to turn into a quilt so I'd love to win this book to get some ideas on what to do with them. I've admired Blair and her work for a long time and have eagerly awaited this book. I have several vintage tablecloths from my childhood that I've been wanting to use in a quilt and am hoping that I'll get the inspiration I need to jump the fear hurdle of actually cutting them. Over the years I have saved clothes with wonderful embroideries. I always thought I would stitch them into a quilt. I'll be interested to see what inspiration this book has for doing just that. I've got a collection of old jeans and denim that I would really love to do in something like the indigo quilt above. So beautiful! Love the vintage hankies quilt. I can remember my grandmother with hankies but never got any to remember her by. thanks for the chance of winning the book. I have been saving old jeans for many years. This book would be a good reference and inspiration! Thanks for this chance to win the book! This sounds like a very interesting book. I seem to have been doing quite a bit of upcycling recently, making backpacks for myself from jeans and for my grand daughter from her daddy's old shirts. Also working through a BOM using my husband's old shirts. I am so glad to have found this movement! yes I call it a movement. I love re purposing and up cycling. I love our planet and our people and I would rather use what I have and pay a fair price for materials, than have more than I need. I am passionately in love with this ideology. I've always said I've never had access to vintage quilts because no one in my family made them, until I saw the picture of that colorful tied quilt. I slept under one of those for many of my childhood years. I never knew they were quilts, they were blankets. I'd love a copy of the book. Thanks for the chance. I am so happy to have read this post. I'll be buying the book for sure, unless of course I win it. A couple of years ago I bought some hankies that have large insects stamped on them. I purchased them at an art student sale and I've always thought I would like to use them in a quilt....so I might find some inspiration here......I'll have to figure out where I've stashed them first though. Ooh, I have a big stack of Tanzanian kangas and kitenges that I've been trying to figure out how to use. I love the sound of this book! I'm definitely going to have to check it out. I have been saving fabrics from my mother-in-laws fabric stash. Much of this dates back to the 60's. I have been saving these gems for a special quilt. My father just recently passed away and my mother gave me a box of his neck ties. My father had great taste in ties if I may say so myself. Making a quilt out of them will be extremely special to me. I have also wanted to learn how to make a quilt out of mine and my husband's old t-shirts that we have collected over the years and many different places. Congrats, Debbie, what a great prize!